This is the first time I’ve had an opportunity to talk about a dead film genre – The screwball comedy. A screwball comedy can be traced back as far as Frank Capra’s “It Happened One Night” and hit its popularity in the mid-1930s and early 1940s, especially when director Preston Sturges made “The Lady Eve” and “The Palm Beach Story.” A screwball comedy is usually about an unlikely romance that forms between two drastically different yet equally awkward and strange characters, and plays heavily on the slapstick and physical side of the relationship. You won’t see screwball comedies today, since they’ve been replaced with romantic comedies. It’s strange to have grown up in an age where romantic comedies are so prevalent, to the point they’re almost a cliché, and then go back and watch films like “Bringing Up Baby” and “The Philadelphia Story” to see how that genre has evolved over the years. The difference between a screwball comedy and a romantic comedy is noticeable, and yet difficult to describe. In a film like “When Harry Met Sally…” you can tell this is about the romance that is slowly forming between two characters, but in “It Happened One Night,” the romance sneaks up on you. These two characters go on a journey together, and slowly realize they want to be with the other. “Mr. & Mrs. Smith” is a screwball comedy that came out in the middle of that craze, but picked the wrong director for the job – Alfred Hitchcock. In a film about a couple that has been unhappily married for a few years finding out their marriage has been nullified and can now do all the single things they’ve wanted to do, Hitchcock is not the proper director for this story. There is no sense of thrill or suspense throughout this film, and almost everything is played for laughs. It comes across like Hitchcock wanted to be like Preston Sturges and tell a witty yet heartwarming story, but gave up halfway through and gave in to the slapstick. As a screwball comedy, “Mr. 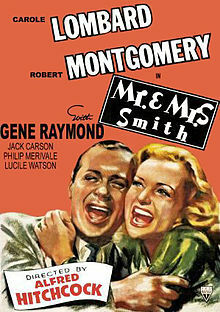 & Mrs. Smith” is a fine distraction that has some good chemistry between lead actors Robert Montgomery and Carole Lombard, with a touching, if a bit rushed, climax in the mountains as the two realize how they feel about one another. But as a Hitchcock film, this one doesn’t hold up at all, with no discernible marks or traits you would expect out of the director.